San Francisco Track and Field Club (SFTFC) has sent its athletes to all nine Gay Games in the past, and we hope to send a strong contingent to Gay Games 10 in Paris. In order to facilitate communication and reduce confusion, we are dedicating this page for our members and supporters who are interested in traveling to and participating in Gay Games 10. We hope this page serves as useful resources for your planning. By the way, SFTFC sent 20 athletes to Gay Games 9 Cleveland/Akron. We made quite a impact on the track. Gay Games 10 projects 15,000 people will participate in the Paris 2018 Game. There will be 36 or more sports and 14 or more cultural events planned at this time. For Track and Field, the organizer is expecting 1,000 athletes. As of July 14, 2016, 892 slots are available. Registration opened on May 13, 2016 via Paris 2018 website at http://www.paris2018.com/. We plan to offer athletic scholarships to those who would like financial assistance to travel to, stay and compete in Paris. Scholarship amount and requirements are not finalized yet, but you can read scholarship details for Gay Games 9 as a reference. Please note that scholarships have been made available through various fundraising events. If you plan to take advantage of our scholarships for Gay Games 10, volunteer at our next fundraising events. In addition, Federation of Gay Games offers limited amount of funds to those who need financial assistance. Scholarship application will be available later in 2016. For details, please check with FGG on their Gay Games 10 scholarship application page. We plan to design a new team uniform. Design discussion will start in 2017. We plan to secure accommodations for those who wish to stay with other team members. Registration opened on May 13, 2016. Visit www.paris2018.com to register. Very Early Birds Registration available through June 13, 2016. Registration closes on June 30, 2018. Items for conditioning/recovery – foam roller, massage bar, compression tights/socks, asprins, etc. Extra personal care items, such as prescription medication, contact lens, etc. At this time, many discussions to make Gay Games 10 Paris 2018 successful are under way. If you have any general or specific questions about our commitment to Gay Games Paris 2018 or about our team, please send us an email using our email form in the sidebar. 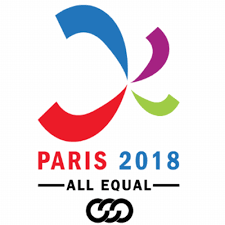 #Paris2018 is planning a unique event celebrating diversity, respect, equality, solidarity, and sharing, with 36 sports, 14 cultural events, an academic conference, and numerous ceremonies and soirées that will take place in the most prestigious venues of #Paris. This international event is open to all who are 18 years or older, without any selection criteria or requirements regarding athletic or artistic experience, sexual orientation, religion, nationality, health, disability, or age. Stadium opens at 7:30 am. First event starts at 8:30 am everyday. Most up-to-date event schedule may be posted on Paris 2018 Track and Field program page.